You must be 25 years old to rent this house! All rooms NEWLY REDECORATED by new owner! Formally named Southern Comfort by the Sea, this adorable three bedroom Beach Home is two blocks from your easy access to the white sandy beaches of the Gulf of Mexico and just steps away from Mobile Bay. Sleeps up to twelve people very comfortably. The home has a fully equipped kitchen with refrigerator, range with oven, microwave, dishwasher, and a full-size washer and dryer so pack light. Small appliances are all new: bring your K-cups for use in the coffee maker with full carafe and K-cup ability, convection toaster oven, George Foreman grill, Belgium waffle maker, and a blender for those frozen tropical drinks. Mix up some homemade ice cream in the new electric ice cream maker provided. Cookware, silverware, kitchen linens, and fun Tommy Bahama dishes are provided. There is no ice maker. You can buy bagged ice at the local convenience store. The living room features two large sleeper sofas. Flat screen HD TV's in living room and all bedrooms with full Dish Network satellite service & internet. The Master bedroom and the Guest bedroom have both been upgraded with new King beds, mattress sets, and quilt sets. Both Master and Guest bedrooms have access to back deck with awesome views of the bay that is frequented by playing dolphins! Full Master bathroom. There is a second full bathroom for the two Guest bedrooms to share. Both bathrooms are equipped with wall-mounted hairdryers. Third bedroom sleeps four and has been decorated with new bunk bed and one twin bed with trundle bed. The home has air conditioning and heat along with ceiling fans throughout for your comfort. Under the house, an outside shower awaits for rinsing off the sand after a day at the beach. For those days when you prefer to not heat up the kitchen by cooking there is a charcoal grill for your use. Parking for four. Dogs under 50 pounds are considered?please call for more information. Comfortable Adirondack-style chairs await you on the covered front porch and back deck for that leisurely morning cup of coffee or that evening glass of wine. 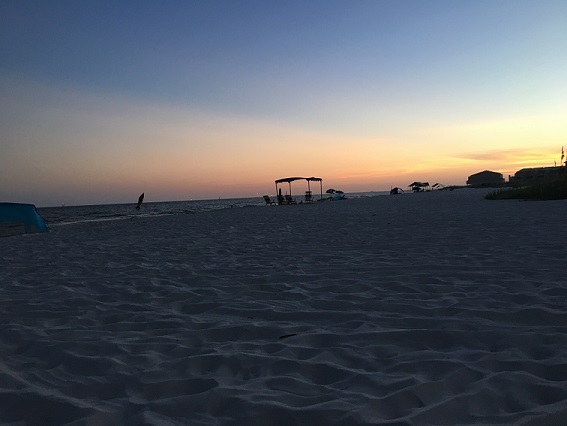 For your short walk to the white, silky sands of the Gulf of Mexico, a beach cart is provided for your convenience and new beach chairs and beach umbrella with sand anchor are provided. Boat launch access for canoe, kayak, small boat, or other motorized watercraft within steps of the house. Don't forget to stop by the office and pick up your free gift from the owner!! Even in the less congested area of Fort Morgan peninsula, you are close to local attractions in Gulf Shores and Orange Beach. You are just 1.5 miles from historic Fort Morgan and the Mobile Bay car ferry that provides transportation to Mobile, AL and Dauphin Island, home of an Audubon Bird Sanctuary. Fishing charter boats and Tacky Jack's bar/restaurant are within walking distance and just a few miles toward town is a local favorite restaurant/bar, Sassy Bass. This house does have an outdoor security camera system. "We had 9 people in total and couldn’t have asked for a better house! " "Yay!! Thank you, Randy, for the positive feedback! I am so glad that Spunky Sandpiper suited your needs and I hope you will return!" "--loved it.. a great time was had by all"
"That is so awesome, Kellee! I'm glad you enjoyed your stay in Spunky Sandpiper! Give us a call when you are ready to come back down!" "Loved it there!! Nice furnishing and close to beach. Very spacey and clean. TV broke down in one of the bedrooms and was changed the next day. Great service if something needs attention to! Would be going back there every year if we had access to a pool. " "Thank you, Don, for taking the time to leave a review of your stay in Spunky Sandpiper! So glad you were pleased with your home! I hope you come back and stay with us next winter!" "Overall, the experience was positive. There needed to be some attention to detail. For instance, we had to replace the batteries in all of the remotes with some not even having all batteries installed. Some items didn't even have a remote (i.e., Blu Ray player). Two of the burners on the stove did not work and while the place was generally clean, air freshness would have helped provide a better atmosphere." "Sorry the remotes were a pain, and we had to replace the batteries during your stay. Thank you for letting us know about the stove, we found that the electrical coils was not plugged into the receptacle correctly. " "I could not be happier with our stay. The house was immaculate. The proximity to the beach and the bay made our trip even better since we like fishing. I love the buffer from the busyness of the city. I hope to return!" "Yay!! Kelly, we are so glad you had an enjoyable stay! We would absolutely love to have you back, just let us know when!" "We enjoyed this beach house a lot. It was perfectly located to the beach. We enjoyed taking the kids crab hunting at night, took the ferry to Dauphin Island, and enjoyed the activities at the Beach Club. " "Whoop whoop!! We are so glad you enjoyed the house and the fun activities Fort Morgan has to offer! Thanks for leaving a review and we hope to see you again!" "We had 9 people staying in our party. 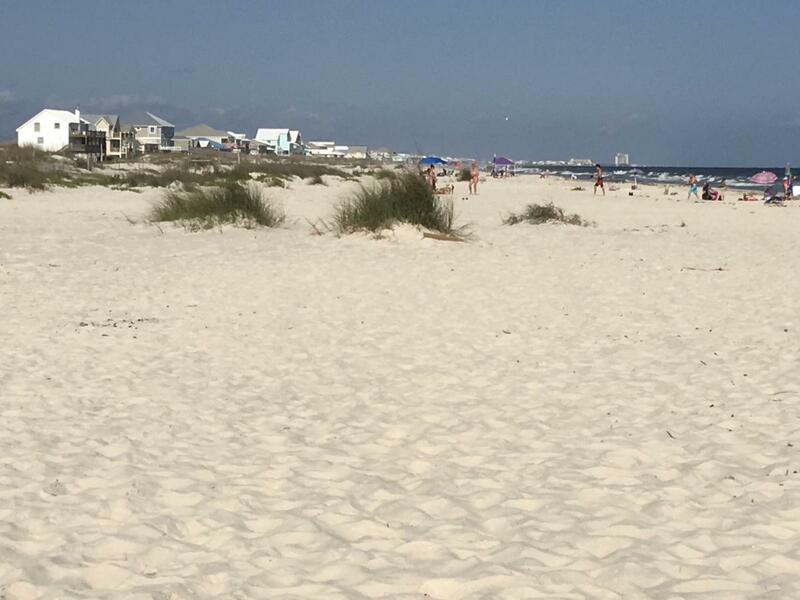 We were 25 minutes from Gulf Shores, and just a few minutes drive from Fort Morgan. The property itself was a 5 minute walk to the ocean and boasted beautiful views of the bay. The staff were easy to work with, and any problem that we had was addressed quickly and efficiently. They were courteous and made sure to try to work around us so as to not disrupt our stay. We very much enjoyed our stay and hope to be back again!" "YAY!! We are so very glad to hear this! We do hope you will come back and stay with us again soon!" "Overall we loved staying in Fort Morgan. For most part, the house was good. I would personally get better living room furniture due to the blue couch has stains on it and fix broken toilet seat. Sunset property people are great and will boom through them the next time we come down." "Yay! We hope to see you again in the near future!" "The house was beautiful! Its has everything you could need! " "Yay! Thank you so much for the review, Jason! So glad that you enjoyed your stay in Southern Comfort! We would love to get you booked again for your next trip!" "With as big a family as we have, we needed a lot of room, and this house was perfect for us. And the location right across the street from the beach was perfect, and it was a quiet location." "We are so glad you were pleased with your accommodations! We love to hear from our guests about their stay with us! Fort Morgan is, indeed, a very quiet and peaceful location. We hope you will visit our Facebook page and give us a good review! We look forward to having you back with us again!" "We loved the house and our stay...only downfall is the fact its 19 miles from everything. If you dont mind being in the middle of nowhere, its the perfect house to stay in "
"We are so glad you were happy with your accommodations! We are a good distance out, but most of our guests love the area because it is quieter out here. Come back and stay with us again soon!" "Southern Comfort is a comfortable house with everything you need for an enjoyable vacation. It's close enough to the beach that a short walk brings you to you the surf and the sand within minutes. The view of the bay from both decks was a plus. A nice quiet location." "Thank you so much for your review! We love the peace and quiet here in Fort Morgan. And what a beautiful view of the bay from Southern Comfort! Hope you come and stay with us again!" "Thank you for sharing you lovely home we had a beautiful white sand Christmas! We look forward to visiting again!!" "Woohoo! I am so glad you enjoyed the house and had a great stay! We look forward to having you again!" "We braved our FIRST hurricane during our stay, Sunset properties were very attentive to our questions and after the storm even checked on us to make sure we were ok!! The house was perfect!!! We had 10 people stay and we were all very comfortable!! When we had hot water issues there was someone at our place in minutes!! The stay was perfect and we can not wait to book this house for next year!! " "YAY!! So glad you enjoyed your stay with us at one of our fabulous properties! We are always glad to help!" "We had a great trip with friends loved the very clean beach house which was very roomy for all 5 of us. Great weather the whole week, Also loved having our dogs with us on vacation they loved the ocean as much as we did. Tacky jacks is the best for eating out and watching the sunsets over the bay and meeting the locals. Until we meet again, U are my SOUTHERN COMFORT!!!!!!!!" "YAY!! We are so glad you enjoyed your visit with us! We will be so glad to have you come out again anytime!!" "Southern Comfort was absolutely great! Way better than the photos show. Everything was right at your fingertips. Loved having the wagon to haul stuff to the beach. The front porch was so nice in the evening, sitting outside watching the sunset. The big king size bed was super comfortable. Got lots of rain the last day so turned it into a shopping spree! Whole process was super easy and smooth, would definitely love to stay again." "Whoop!! Sp glad to hear this!!" "I was in the area for a conference. My family enjoyed a week at the beach while I was in meetings. Very quiet area with a nice beach. Being pet friendly was a huge plus. I would recommend this house." "So glad you could incorporate business and pleasure! It is a great house, we hope you can come back soon!" "Bay view from back and front porches. Short walk to the beach. Very spacious. Clean and comfortable. Only problem is no grocery store for 19 miles. " "We are so glad to hear back from you! It is a bit of a drive, we always try to let everyone know, for future reference there is a small market only 4 miles away for emergencies!" "We only got to go to the beach two days because of tropical storm Cindy. Even though there was a storm, wind and lots of rain we felt safe in the house. There were games and good family time." "Whew! That was a close one, so glad the storm wasn't worse than it was! There were still some good days, thank goodness! glad you still had a good trip!" "THIS WAS A GREAT EXPERIENCE. WE HAD A WONDERFUL WEEK IN THE SOUTHERN COMFORT BY THE BAY. GREAT BEACH ACCESS AND FISHING IN THE BAY. " "This is a great house and we are so glad you enjoyed your visit here! Hope to see you again soon!" "A great home for that beach get-away. Location is amazing just steps away from Mobile Bay and a couple blocks from the white sandy beach of the Gulf. The beach is private so only residents and guests were using it-- not crowded at all. The view off the back deck is priceless--saw dolphins playing in the bay. House is decorated very nicely. Will definitely be back and will be recommending to my family and friends." "So glad to hear this! Yes, we love our houses on the bay, fantastic views for sure! " "Very clean, nice place to stay for a quiet vacation. Close to the bay and a short walk to the beach. Best vacation!" "Awesome! I'm so happy you had a wonderful time!" "everything was as promised. house was clean and everything needed was there.yard was also neat and clean. " "Thank you for writing a review, we are so glad you enjoyed your stay with us!" "Sunset properties was very helpful with all questions that we had. We originally booked a condo, but because our dog was over 25lbs we had to change it to the house. The process was very easy and the staff was very helpful. Check in states as 3pm, but after a 13 hour drive sunset properties was kind enough to let us into the house at an earlier time. The office is located really close to the house so it is extremely convenient. Overall we were very happy with our stay as well as the property. The night we arrived we had issues with the water heater and couldn't take hot showers and the maintenance man was able to get there within 30 minutes which was very much appreciated!! We will definitely be coming back soon because we were absolutely satisfied with our stay her at Southern Comfort!!!" "Yay! We are so glad to hear from you, we hope that we will see you again soon!" "Very nice home. We loved the location just a short walk to the beach and view of the bay. We would definitely stay again!" "It was fantastic! It was easy to pick up and drop off keys. Our friends stayed in Southern Comfort while we stayed a couple houses down. We know the area well and it was perfect place for our families to vacation. "